Jungle Spirit: Call of the Wild takes players to the heart of the rainforest in search of exotic creatures. It’s a slot that has clearly been designed to be visually impressive but also packs in quite a few innovative game features. The theme is suitably generic to not offend many potential punters but also exciting enough to allow the designers a wide scope when creating the imagery for the game. In terms of specifics, it’s a three row, five reel game played across 20 fixed win lines. The highest jackpot is a measly 150x the line bet and players can bet up to £200 per spin. Looks the part. The animal symbols and background have been tastefully designed. Interesting game features. These give the title considerable replay value. High return-to-player rating. This is something of a hallmark on Netent’s games. Very low main game prizes. We’re used to seeing 5,000 and 10,000x the win line. This makes the 150 on Jungle Spirit seem stingy. No “wild” symbol. Whilst it’s entirely possible to have a slot machine that lacks a symbol that can substitute for all others, they certainly add additional excitement to enjoyment of a game. Tiger = 150x the line bet. Elephant = 100x the line bet. Bear = 80x the line bet. Crocodile = 70x the line bet. Cobra = 60x the line bet. During the Symbol Expansion feature all symbols except the “scatter” symbol may be marked by butterflies. Any symbol that is marked by butterflies and that takes part in a winning combination will expand to cover an entire reel. This feature applies to both the main game and the free spins. The Butterfly Boost feature is activated at random during the main game. The butterflies fly around the reels and will expand one to three symbols that take part in a guaranteed winning combination. The expanded symbol will cover the entire reel. To trigger the free spins, players must first land between three to five “scatter” symbols anywhere on the reels in the main game. 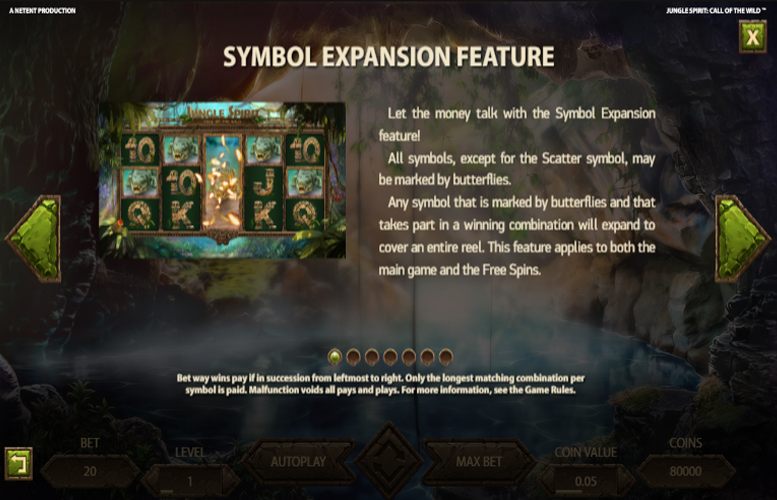 If free spins are triggered with either four or five “scatter” symbols, the player receives a coin win that equals 15 or 50 times the bet respectively. Players are given the opportunity to select one of five different Free Spins options. Each option grants a different number of free spins and has its own dominant medium win symbols. Free spins are centred around the animals chosen. The options with fewer free spins have higher risk but come with a greater win potential. During the game’s free spin mode, an additional row is added. This gives players a lot more ways to win – 1,024 ways to be precise. Along with the high and medium valued symbols on Jungle Spirit, there are also some that award low prizes. As is common on online slot machines today, these have been taken from the upper end of a standard deck of playing cards (A, K, Q, J, 10). Each of these will pay at 30x the line bet. Being as the number of win lines is fixed at 20 on the Jungle Spirit: Call of the Wild slot machine, players are only able to change the value of each coin bet and the number of them waged per win line. The maximum and minimum values are ten and one respectively. Meanwhile, the maximum and minimum coin values are £1 and 1p. This means, with all variables set to the lowest, the smallest possible bet per spin is just 20p. Meanwhile, with everything maxed out, the highest bet per turn is £200. Whilst those who want to play nosebleed stakes might find this somewhat restrictive, these limits should be more than enough for most players. 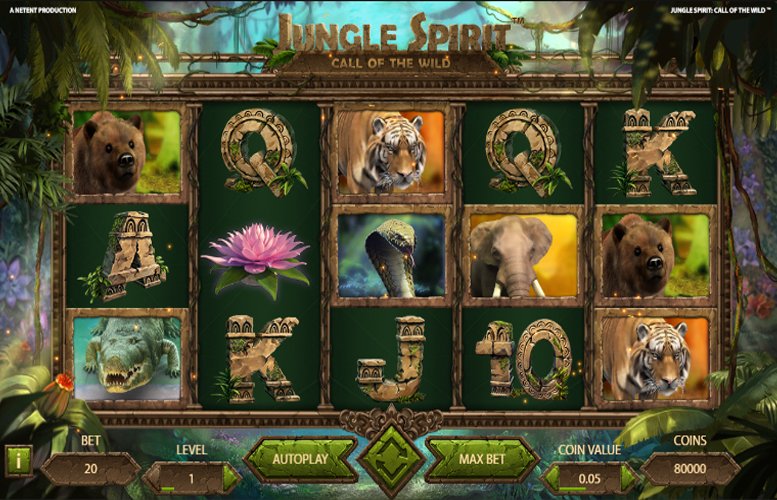 The Jungle Spirit: Call of the Wild slot machine from Netent is title that excels in the looks department. The animal imagery will certainly delight all those who have ever dreamed of trekking through the rainforest and encountering some of the planet’s most exotic creatures. Meanwhile, a diverse set of features on the machine add considerably to the replay value. That said, there are a few drawbacks with the machine. The chief of these is how low the main game prizes are. 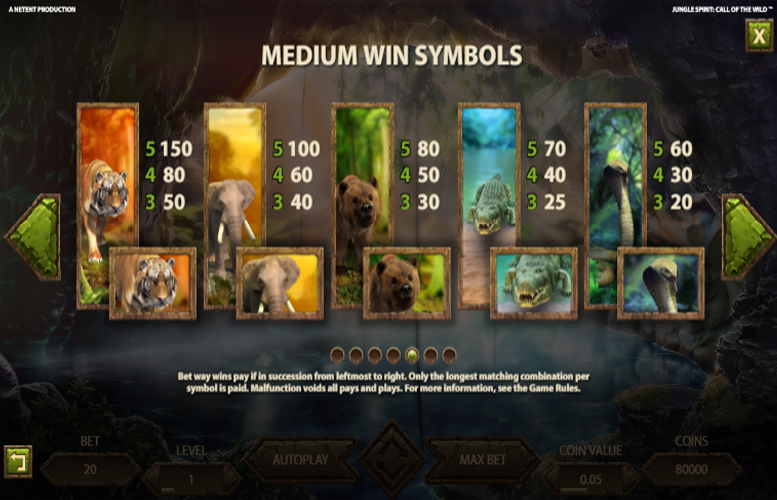 When you’ve played games that offer 10,000x the line bet as a top jackpot, the 150 offered on Jungle Spirit: Call of the Wild just doesn’t seem to cut it. This game has a rating of 3 / 5 with 491 total reviews by the users.